Here are some great scans at Bronaugh School shared by Charles W. Ray Jr. The slate in the bottom photo appears to say October 1927. However, it is difficult to be sure. It could be 1924. 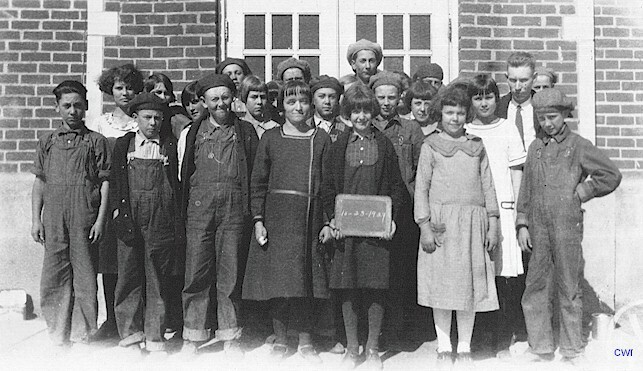 Deloris Sheridan Heitz believes that the top photo is a 1925 photograph of students in their first year of school and has shared identifications. Back row: Harold White, Dean Garton, Clara Smith, Orin McMillan, Veva Warner, Norval Campbell, Leonard Gaston, Marjorie Noel, Louis Musgrave, Miss Eula Terrell and Ona Moore. George Burkett is the teacher. 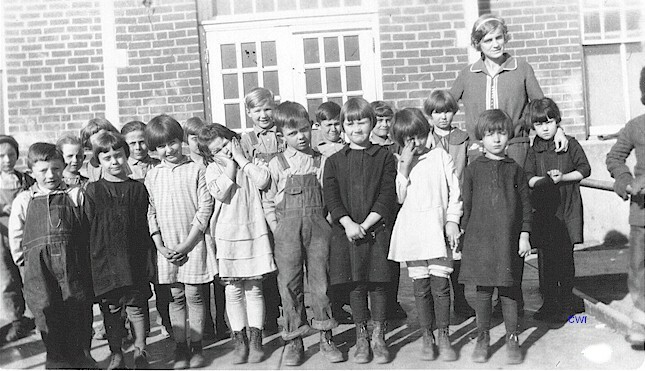 Ina Moore is second from right, first row. Ora Moore is fourth from right, second row. Elmer Moore is on the left on the back row. Susan Doores identifies Joe Doores as the young man front row left. The rest are unidentified. If you can identify anyone let me know.